HubSpot is an all-in-one marketing automation software that helps companies attract visitors, convert leads, and close customers. It's a tool to help make your marketing friendlier, by being engaging, less visible, and less intrusive. After all, the goal of HubSpot is to stop annoying customers, and start helping them. HubSpot began life as a CRM but it has evolved into something much more powerful! It now ties your CRM, email marketing, CMS (Website Builder), SEO, marketing automation, landing pages, analytics, social media and content marketing into one easy to use platform. HubSpot centralises everything. 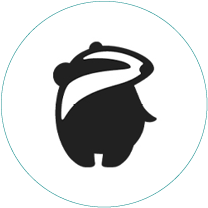 All your information is available for all of your teams in a single place. This makes managing your marketing efforts easier. parts of your marketing strategy simpler, more effective and easier to show ROI. These aren’t just any old tools. HubSpot brings together the industry-best - a bold statement backed by their customers. 34,000+ companies in more than 90 countries use HubSpot. HubSpot is the leading software provider for managing and assessing inbound marketing and inbound sales in one space. HubSpot coined the term ‘Inbound Marketing’ and hanging your hat on HubSpot is essentially hanging your hat on Inbound Marketing - and that’s a wise choice. People are tuning out old-school outbound marketing and sales tactics. Buyers have changed the way they consume marketing material and you have to reflect this in your marketing strategy. Inbound marketing has taken it's place and proven its worth time and time again for thousands of companies. When implemented correctly, you attract more visitors, convert more leads, and delight more customers. FAQ: The difference between inbound and outbound marketing. Inbound marketing has taken its place and proven it's worth time and time again for thousands of companies. When implemented correctly, you attract more visitors, convert more leads, and delight more customers. 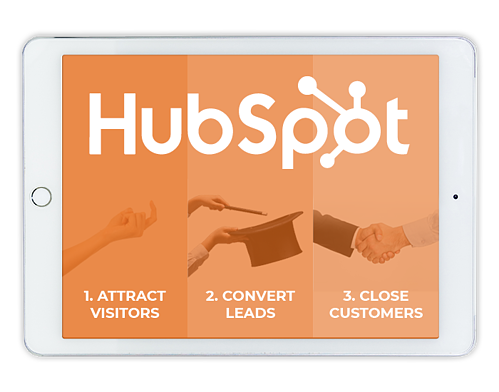 HubSpot is the best software to enable your inbound marketing efforts. You have 3 service offerings, the Marketing, Sales and Service Hubs. 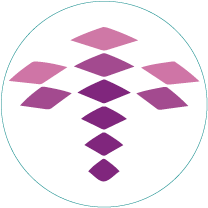 Each offering has 1 free tier and then 3 paid tiers, Starter, Pro & Enterprise. The marketing hub is where you attract and convert leads for your business. Please note: Some tools & functions cross over with Sales and Service hub. Some restrictions may apply to tools & functions in the Starter & Pro packages. Packages are subject to change, for the most up to date package information visit HubSpot. The sales hub is where you convert and close leads into customers. Please note: Some tools & functions cross over with Marketing and Service hub. Some restrictions may apply to tools & functions in the Starter & Pro packages. The service hub is where you ensure you deliver a fantastic service your customers will shout about. Please note: Some tools & functions cross over with Marketing and Sales hub. Some restrictions may apply to tools & functions in the Starter & Pro packages. Interested in the FREE HubSpot Marketing & Sales Packages? You have another option for your choice of package and it's called the HubSpot Growth suite. HubSpot’s Growth Suite bundles each level (Starter, Pro & Enterprise) of the marketing, sales, and service hubs. These bundles are fully integrated and discounted at 25% off their standalone price. For example, if you want to purchase Marketing Pro Hub, Sales Pro Hub & Services Pro Hub - that’s the Pro Growth Suite bundle. Entry-level access to the tools you need to start engaging with your contacts and customers across every stage of their journey. Access to the professional tools your team needs to drive growth, along with robust automation that helps you deliver personalisation at scale. 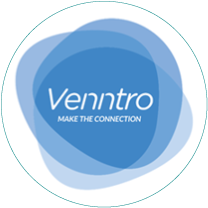 More control, greater flexibility, and deeper integrations — without making life complicated for you, your team, or your customers. Feeling a little overwhelmed with all the options? The best thing to do is to talk to us and we’ll help you pick the right package for your business. Choosing the right package is where a lot of businesses stumble, get confused and throw in the towel. There are 64 variations you can pick from - hence the confusion. The right package for your business will depend on what you want to get out of HubSpot. Do you want more automation to reduce staff admin? You’ll need Marketing Pro or Enterprise. Do you want custom reporting to better show marketing ROI? You’ll need Marketing Pro or Enterprise. Or maybe you need to add extra contacts? In that case the Enterprise package could be more cost-effective. The HubSpot sales team has a bit of a reputation of scaring people with hard-sell tactics so the best way to figure this out is to talk to us. We don’t try to upsell HubSpot packages because we know if it’s not right for you, you won’t stick around. But if you need to upgrade later, it’s no problem! Now you have a better understanding of HubSpot and its capabilities, you will notice that while HubSpot is a hugely capable piece of software with all the bells and whistles, it is still only a piece of software and without a dedicated and knowledgeable team it may be difficult to utilise HubSpots tools and functions to their full potential. If you have decided to invest in HubSpot we know it is important for your business to reap the benefits of this investment as soon as possible and that’s why we operate as a partner agency for HubSpot. If you have decided to invest in HubSpot we know it is important for your business to reap the benefits of this important investment as soon as possible and that’s why we operate as a partner agency for HubSpot. This means we can support your business from its first tentative steps into the world of HubSpot right up until your ready to test out your new HubSpot wings and fly solo. Why choose UX-Digital for your HubSpot Management? We want to build lasting relationships with our clients and help them become confident operating within the HubSpot platform. Whether that means supporting a gradual HubSpot integration or jumping straight in and migrating all marketing, sales and customer service efforts in one go. We have clients across the full range of HubSpot packages making us an ideal and versatile Agency to manage your HubSpot Portal. Our team has skills across all HubSpot tools and functions, whether it's content strategy and creation or email campaigns and building custom workflows, (the list goes on!) we can help you make it happen with HubSpot! Onboarding is mandatory. We’ve tried to wiggle around it but HubSpot draws a line in the sand and if you want to use their marketing software you have to cross it. They insist on this because it vastly increases the chances of clients having success with the software. A dedicated onboarding will ensure your portal is set up to suit your needs and that your team becomes familiar using the different tools. The type of onboarding you need will vary based on your goals, skills and time frame. If your team is fairly technical, they won't require the 3-month onboarding the direct HubSpot teams deliver. Likewise, if you want to get going ASAP, our fast-track onboarding will be better suited to your needs. Whether you chose an Agency to get you started with HubSpot or decided to go solo with HubSpot direct, you may find yourself with a one-off task here or there that you don't have the time to fit into your team's schedule or your lacking the expertise to execute. This is where our brilliant new HubSpot task support can help out! Even if your team's are confident working in HubSpot from time to time a little extra help goes a long way, particularly for the more complex or time consuming tasks. This fantastic option is more cost effective than being tied into an expensive ongoing support retainer if you don't need support all the time. We have listed just a few of the services we can provide as one off task support below but just because it isn't here dosen't mean we cant help! Any agency will tell you the best sign of a partner agencies competency is them using the HubSpot platform to grow their own business. That’s why we were delighted to become a Gold Partner in less than 9 months - a rare feat - and we were chuffed again to be named in the HubSpot Rookie Of The Year List for 2019. Our success in growing our business with HubSpot is down to our experienced team who have been involved with HubSpot since it first started making waves. Our clients range from smaller businesses on Starter packages, right up to clients on the Enterprise Growth Suite. So, whatever stage you’re at, we have the knowledge and expertise to help you drive growth and achieve a return on your investment. "We've been using UX-Digital since we started our onboarding process with HubSpot. They were vital in our set up as we were beginners with the CRM. Our point of contact was quick to respond, and their tips and tricks were crucial in getting us up and running. Would highly recommend!" "UX digital have been instrumental in making sure we're getting the very most out of every HubSpot feature. I'm confident that had we tried to tackle setting up all the many functions of our HubSpot package ourselves we would certainly be in a bit of a mess!" "The HubSpot suite of tools can be remarkably effective for many businesses. But they can only be fully realised when supported by a remarkable agency. UX Digital falls into that bracket. Remarkably good, friendly, knowledgeable, and supportive. Highly recommended." 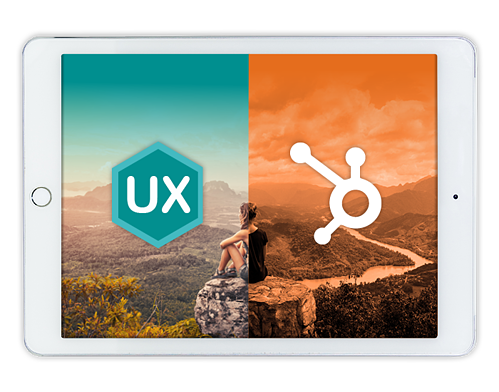 Book A HubSpot Discovery Session with UX-Digital now! How Long Until You See Results with HubSpot? This depends on what content you have already, and how comfortable you are navigating around the software. On average, you’re looking at the 4-month mark when HubSpot really starts firing. But, be prepared for a challenging first 12 months. How much does HubSpot cost per month? There are free versions of each Hub, but the paid versions currently range from £95 - £3,453/month. Is HubSpot easy to use? The user interface has been designed to make navigating around the tools a breeze. You'll be surprised at what you can accomplish without a developer, but you'll probably need support for the more technical tasks - like the automation & sequencing. HubSpot also integrates smoothly with a WIDE variety of business software, making your life easier. Yes, Hubspot is a cloud-based, all-in-one, integrated marketing and sales software suite. What is inbound and outbound marketing? Outbound marketing is where a company initiates the conversation and sends its message out to an audience - often interrupting their experience. Inbound marketing is where the customers find you when they need you. Are the HubSpot academy certifications worth doing? Only if you are serious about getting the most out of HubSpot. You don't have to understand everything (as you'll likely have an agency partner to help you), but it'll give you a nice foundational understanding when you talk to your partner. If you don't want to work with an agency partner, completing most (if not all) of the certifications is a must. What is a HubSpot Partner? A HubSpot Partner is typically a marketing agency that offers services to compliment HubSpot's software. These businesses get exclusive resources and training, and work in the tools day-in, day-out. They will help you get the most out of HubSpot. There are different tiers based on their experience: None, Silver, Gold, Platinum, Diamond. When will I get my first HubSpot lead? This depends on your starting point and you have to be honest about where your business is at. If you already have a lot of applicable assets and a reasonable website, you will see leads coming in sooner. If you’re starting from scratch, then 3-5 months is the realistic expectation we would set. And if you need a website re-design, this will push back the time-frame. You also need to understand there will be a dip in leads during your onboarding process, as HubSpot or your partner agency first has to set up your portal and plan your marketing strategy. HubSpot onboarding is a non-flexible 3-months, which for some is too long to wait for leads. This is why onboarding with UX-Digital is beneficial: we offer Fast-Track HubSpot Onboarding to get you up-and-running as quickly as possible.